Make these Albuquerque Transit Centers part of your commute. Parking is at your own risk. Do not leave anything of value in your parked vehicle. ABQ RIDE Security randomly checks all five transit centers. ABQ RIDE provides bus travelers the ease of commuting across town without the headaches of traffic. 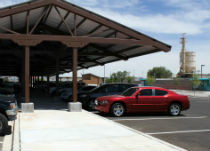 Simply park your car or lock up your bike at one of our five transit centers throughout Albuquerque, and take the bus! Parking and Wi-Fi are free at all transit centers. View ABQ RIDE routes and schedules. Traffic signals at the Montaño Transit Center are functional.